Warner Bros. has long been among Hollywood’s most ferocious anti-piracy advocates, but it seems the studio has shot itself in the foot during its latest pursuit of justice. In a recent DMCA notice to Google, Warner Bros. has mistakenly flagged one of its own pages for pirated content, asking Google to remove the entry from showing up in search results, TorrentFreak reports. 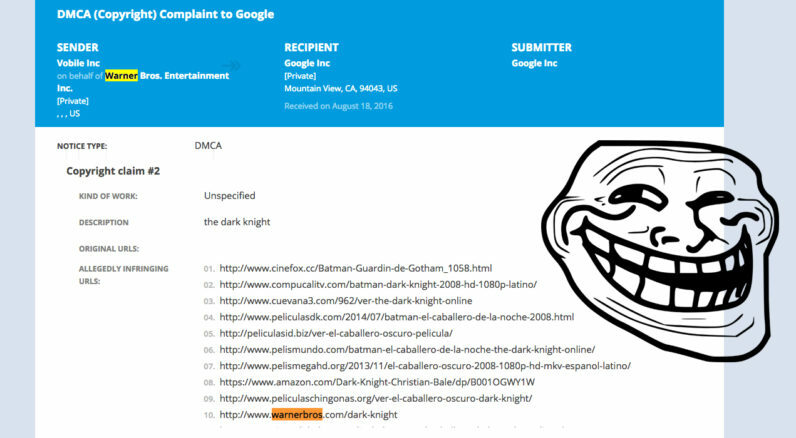 As you can see in the screenshot below, the complaint refers to Warner’s Oscar-winning flick The Dark Knight. What’s interesting, however, is that one of the reported pages in the list links to the studio’s own website. This isn’t the only time Warner Bros. has made a similar error. The studio’s website also appears among the list of websites supposedly violating the copyrights for sci-fi classic The Matrix, as well as romance drama The Lucky One. While it’s understandable that Warner Bros. wants to make it harder for the public to access pirated content, its own domain is not the only website the company has wrongly accused of violating copyright laws. What’s more problematic is that the complaints also list a number of other legitimate pages, including several official IMDb entries, as well as a link to Amazon where users can purchase a copy of The Dark Knight. Fortunately, Google was careful enough to catch Warner’s mistakes. The wrongly reported pages will continue to be indexed despite of the studio’s requests to take them down. Still, one can only wonder how many legitimate pages Warner and other studios have managed to wipe off the face of the Web given the staggering number of DMCA notices that Google receives. In any case, flagging your own website for piracy is a negligent move and Warner Bros. has a thing or two to learn from DJ Khaled – don’t ever play yourself.